From an alluvial deposit in the remote regions of the Alto Ligonha region of Mozambique, approximately 300 miles from Nampula, comes this attractive pear-shaped stone. The deposit, which was found only four years ago, is one of copper-bearing or cuprian tourmaline. After much debate, the world’s major laboratories have now agreed to use the coveted term “Paraiba” to describe the most vivid hues of copper-containing tourmaline—particularly for those blues which are described in the trade as being “Caribbean” or “Windex” blue—regardless of the country of origin. 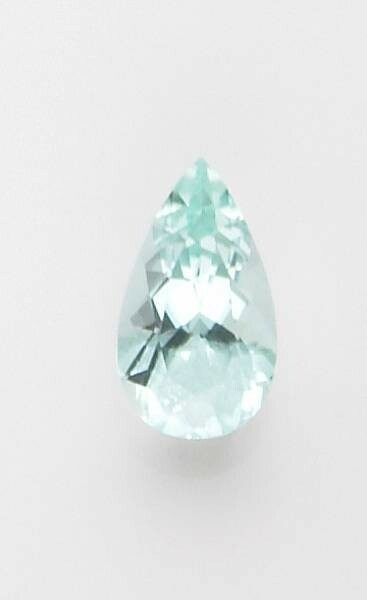 The designation of “Paraiba” was previously only permissible for those stones which actually originated at the São José da Batalha Mine in the state of Paraiba, Brazil.